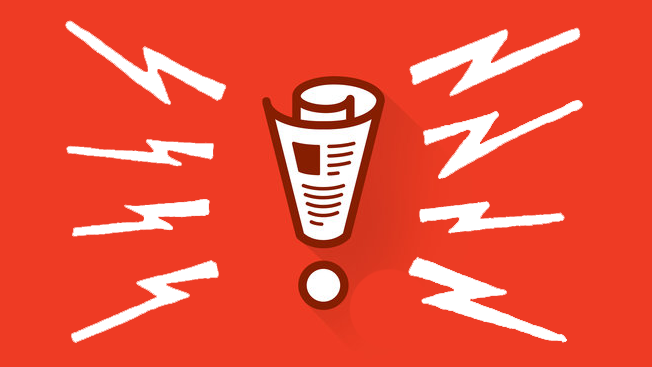 Thanks to monster hits like Serial and This American Life, podcasting has had a bit of a renaissance in the past year, and it's also fueling National Public Radio's digital revenue. Over the past year, NPR says it has more than doubled its podcast revenue, and the public media icon expects to see equally robust growth in 2016. Meanwhile, it's been adding new shows like Code Switch—a program about race and identity that built a following through radio, blogs and social before becoming a podcast. Similarly, NPR science correspondent Shankar Vedantam parlayed the popularity of his "Hidden Brain" social science news segments into a podcast of the same name, which launched in September. The science and storytelling podcast Invisibilia, launched in early 2015, is about to return for a second season. In terms of advertisers, big-name brands like Wells Fargo and smaller names like Squarespace are buying into audio-based programming. "We'll probably more than double this year, and, the year before, it tripled year-over-year, so we've been seeing really great growth over the past three or four years in podcasting. Just looking back, I think we're 10 times where we were three years ago," said Bryan Moffett, general manager of National Public Media, NPR's corporate underwriting division. Still, Moffett thinks the real growth hasn't happened yet for the category. "The growth has been great, and the evolution has been steady for the past 10 years, but I'm preparing for the hockey stick right now," he said. Part of that is because brands are still figuring out what works, and trade organizations such as the Interactive Advertising Bureau are creating standards for publishers and advertisers. "We work with a lot of Fortune 100 [brands] that have been buying NPR on the broadcast side for years and they need scale, but they also want quality," said Gina Garrubbo, president and CEO of National Public Media. "It's a good combination of brands that have been on broadcast migrating to podcast and some coming back only wanting podcasts who [now want to] migrate to broadcast," Garrubbo said. "Sometimes people come in via podcast, and they can't afford the broadcast, and then they realize after they have effective results that that's probably a good place for them to be." Wells Fargo, for instance, used to advertise with NPR broadcast in the past but then took a break in recent years. Now the brand is one of the publisher's podcast advertisers. Conversely, Squarespace—a brand well known for advertising on podcasts—is now buying radio ads. 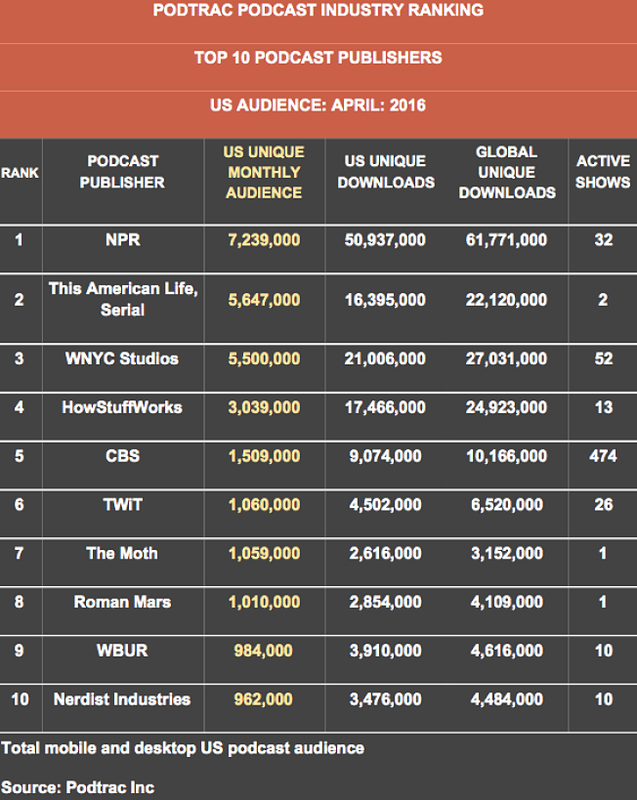 On Tuesday, podcast measurement and advertising company Podtrac named NPR the top podcast publisher by size. The company's data measures 90 percent of the top podcasts, with 28 million unique monthly listeners in the U.S. and 38.5 million global listeners. To be included in the rankings, publishers must have at least 30 days' worth of data that can be analyzed. Coming in at No. 2 was the combination of This American Life and Serial, which operate independent of NPR and are produced by WBEZ and Chicago Public Media. Together, they tallied 5.6 million monthly U.S. listeners and 22.2 million downloads on Podtrac's chart. Other top podcasts include WNYC Studios (5.5 million monthly listeners), How Stuff Works (3 million listeners) and CBS (1.5 million monthly listeners). Here's a look at all of the Top 10 podcasts. In terms of where consumers tune into podcasts, Apple dominates how people listen—65 percent of programs are listened to on iTunes or Apple's Podcast app. Another 16 percent of people listen on another type of mobile device, and the remaining 19 percent of folks listen from apps including Stitcher, Overcast or another desktop browser. In total, 85 percent of podcast listening takes place on mobile. In addition to the explosion of mobile and new interest from listeners, NPR has also added mid-roll ads—popping up in the middle of podcasts—in the past year. Previously, advertisers could only run pre-roll ads that give a shout-out to brand before a program begins. Mixing up the placement of the ad is key, explained Garrubbo. "When it's a host-read mid-roll, our audience has a much better perceptions. It feels like less of an interruption," she said. "I think there's a unique, emotional connection that our audience has and most audiences have to podcasts—I'm not sure if it's the audio on demand, if it's the earbuds, but there is a greater emotional connection. We've found that three-quarters of our listeners report feeling warmth and they have a more positive opinion of brands that support NPR and three-quarters of them take action in response to sponsor messages."